Choc & Nut Granola - Crunchy cereal clusters with chocolate & hazelnuts Peanut Butter Clusters - Oat, Maize, Wheat and Peanut Clusters. 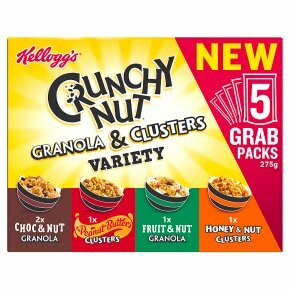 Fruit & Nut Granola - Crunchy oat clusters with dried fruit and nuts. Honey & Nut Clusters - Crunchy multi-grain cereal, peanut & honey clusters. The trouble is they all taste too good! Tasty anytime snack. Suitable for vegetarians. Choc & nut granola, fruit & nut granola - Halal - HFA approved.